So, you might recall that I said that I would be submitting #SadPuppies Bite Back to Castalia House as soon as I had readers done with it. My readers FINALLY finished it. How one reader can finish a 70,000 word mystery in three days and yet take over a month with a 20,000 word parody is beyond me. There will NOT actually be a release of #SadPuppies Bite Back. It will NOT be coming out in book form. However, there will be Tearful Puppies Bite Back, a tie-in with Set To Kill. If you might recall in Set to Kill, there are a colorful cast of characters who look NOTHING AT ALL like the Sad Puppies. Honest. Really. Among these characters is Matthew Kovach, a young upstart author who has done a parody series called Tearful Puppies Bite Back. There are a few excerpts of the parody in Set to Kill, but otherwise, there isn't a lot of overlap. I'm thinking that the complete Tearful Puppies Bite Back will make a great companion piece to the novel. And of course, it won't be able Correia and Ringo and Hoyt and company, but about Rachel Hartlery, and Gary Castelo, and Jesse James. There won't be ANY similarities to the Sad Puppies at all of course. Then again, I'm not sure there was any the first time. And we have a cover. Normally, I would submit it to Castalia, but if they don't take Set to Kill, I can't imagine they'd want this, either. And if they did take Sad Puppies Bite Back as Sad Puppies Bite Back, it would basically be the key to the other book. So, here's the short version: the schedule is still on. The moment Castalia nixes Set to Kill, both Set to Kill and Tearful Puppies Bite Back will be out within the week. Probably even faster than that. I'm not going to say that my patience with publishers has run out, but I do assume that any halfway decent publisher wouldn't want me on a dare. The rejection / acceptance for Set to Kill should be in shortly. I did submit to them about a month ago now, so we'll see what happens. Either way, these books will be published. It will be done. 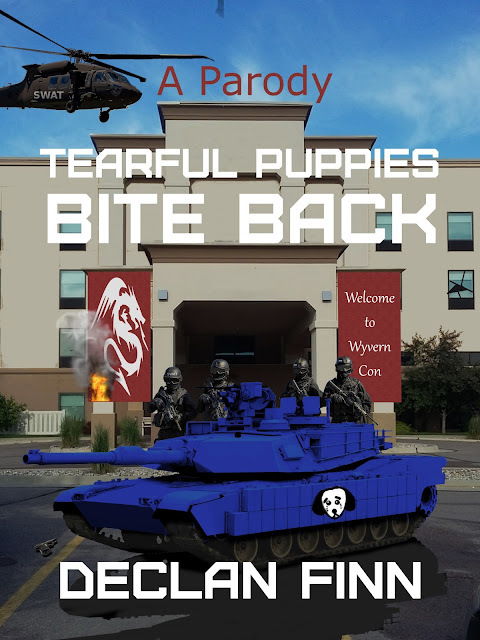 At the very worst case, Tearful Puppies Bite Back will be a kindle only release. It's only 25,000 words. And that's with introductions, that will probably need to be redone, since I'm cutting out parts of the parody. Also, I submitted all three of the Love at First Bite books that I have written. It's at least a quartet, and the fourth one is half written. I find it unlikely that Castalia would want the first one, since it's already published. As for the rest, who knows, they may not want books when they don't have book one. Who knows? I'm not sure that the "printed means spoiled" meme is still valid. And I don't think you can say that Castaglia follows any kind of mainstream decision cycle. So I wouldn't be that surprised to find that they publish the book, specially since there're unpublished sequels already written. Printed doesn't mean spoiled. But this is a 25,000 word collection of vignettes. I worry that the createspace formats will make it cost too much versus the content. Say what? "There will NOT actually be a release of #SadPuppiesBiteBack. It will NOT be coming out in book form." Okay. Fine. If I can find a format that DOESN'T have me charging $15 just so I get a little bit of a profit, I'll do a real book. Check Lulu.com. I've gotten a few OSR books through them, and the printing's good. I don't know the details for publishing through them, but the quality and prices I've seen tell me you can do all right.